Italian painter, original name Giovanni di ser Giovanni Guidi. The son of a notary and younger brother of Masaccio, he spent some time as a mercenary soldier. From December 1420 and through the following year Giovanni is recorded in Florence in the workshop of Bicci di Lorenzo. In 1426 he is mentioned in the estimo and in 1427 in the catasto (land registry declaration) written by his brother. Documents suggest that he was in close collaboration with Masaccio s workshop. In 1429 Giovanni paid a three soldi tax based on his own professional activity. In 1430 he enrolled in the Compagnia di S Luca, where he appears as Scheggia ( Splinter ), a nickname given in Tuscany to individuals of slight stature or who are somehow connected with wood. On 23 October 1433 Giovanni matriculated in the Arte dei Medici e Speziali. 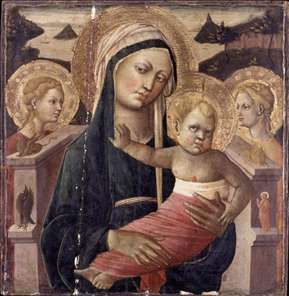 The Virgin and Child with SS John the Baptist, Anthony Abbot, Julian and James (private collection), which recalls the style of Masaccio, is datable to the 1430s or 1440s. It shows close similarities with Giovanni s only signed work, the fragmentary fresco dated December 1457 depicting the Martyrdom of St Sebastian in S Lorenzo, San Giovanni Valdarno. The frescoes of the adjoining bay depicting scenes from the Life of St Anthony Abbot are also stylistically similar to the work of 1457. The same hand was recognized in the signed fresco and in works previously attributed to the anonymous painter designated the Master of the Adimari Cassone, also known as the Master of Fucecchio. The former name refers to a spalliera depicting a wedding scene (Florence, Accademy), while the second derives from the altarpiece from the collegiate church of Fucecchio, near Empoli, depicting the Virgin and Child in Glory with SS Sebastian, Lazarus, Mary Magdalene and Martha (Fucecchio, Museo Civico). The panel depicting a game of civettino (a kind of boxing; Florence, Palazzo Davanzati), perhaps originally part of a forziere (nuptial chest) or spalliera, has been assigned to the Master of the Adimari Cassone. Scheggia s known works primarily consist of colmi (little tabernacles) depicting the Virgin and Child intended for private devotion, birth salvers and paintings for furniture, including panelling and forzieri decorated with single figures on the inside of the lid or depicting a narrative scene. Between 1436 and 1440 Scheggia collaborated on the intarsia designs for the cupboards on the south wall of the Sagrestia delle Messe (new sacristy) in Florence Cathedral. The testimony of Brunelleschi s biographer Antonio Manneti indicates that Scheggia was on close terms with the architect. 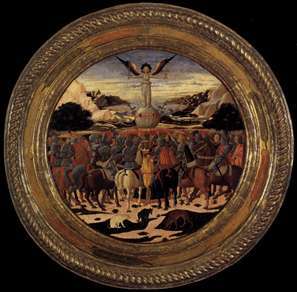 For the birth of Lorenzo de Medici on 1 January 1449, Scheggia was commissioned to paint a birth salver depicting the Triumph of Fame (New York, New York Historical Society). Among the chests with wall panelling inventoried in 1492 in the Medici town house on the Via Larga, Florence (all untraced), was a spalliera, recorded as by Scheggia, that depicted a famous joust of Lorenzo s in 1469. In 1469 Scheggia declared to the tax officials that he was infirm. His last report is dated 1480. See more details about "Madonna and Child Enthroned"
See more details about "Triumph of Fame (a Birth Salver)"